20Television has expanded exponentially recently, thanks largely to streaming, but if we go back just over a decade, things were very different. 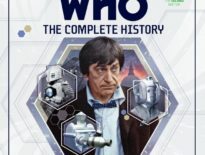 Forget Game of Thrones, Great British Bake-Off, and The Walking Dead: This issue of Doctor Who: The Complete History takes us back to when Doctor Who was the biggest show in the universe. 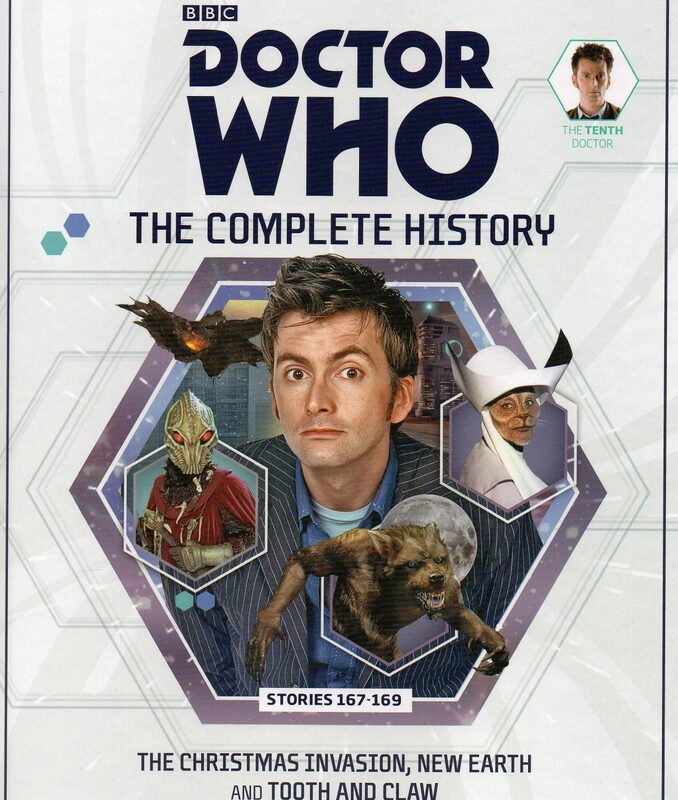 And rather appropriately, with The Complete History #7 covering The Christmas Invasion, New Earth, and Tooth and Claw, reading the behind-the-scenes details of David Tennant’s early adventures as the Tenth Doctor feels like catching up with an old friend, perhaps sharing a tipple by a roaring fire. The breadth of these stories, notably their tones, are poles apart, and that comes across in the design of this volume. There’s that nostalgic warmth, tinged with melancholy, for The Christmas Invasion, the freshness and bizarre joviality for New Earth, and the wonderfully dark horror tropes in Tooth and Claw – highlighted by the artwork that introduces each serial, and the backgrounds for each page. It’s a gorgeous-looking book, drawing inspiration from the colour palettes of these adventures: The Christmas Invasion in golds, reds, and blues; New Earth in greens; and Tooth and Claw in oranges and purples. Still, however much they vary in tone, there’s a sense of joy in all three stories. The production crew were riding the wave of success, so even if they were all nervous about living up to Series 1, it didn’t really come across that way. 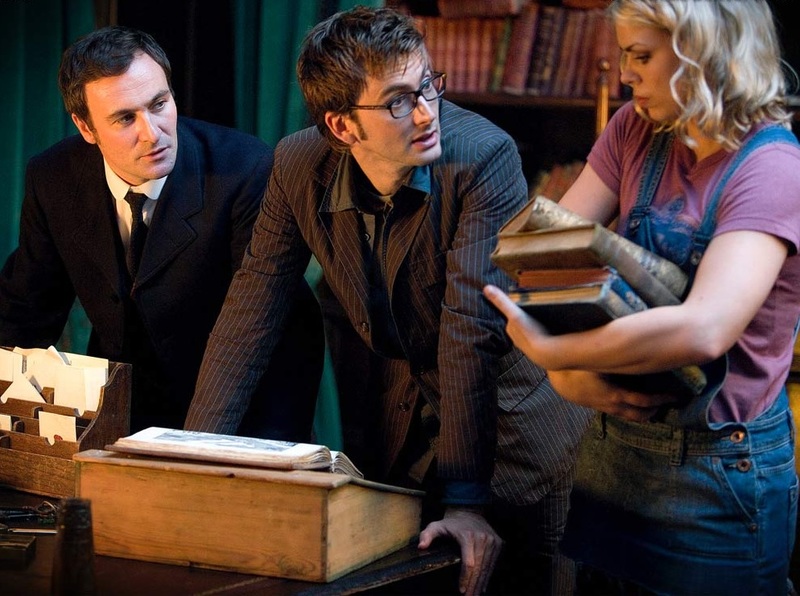 The Tenth Doctor didn’t stop running, not in those days. It was a wonderful time, though some feel Series 2 was ultimately a let-down (not an opinion I share, but there you go). It’s reflected in the text of this issue; there’s hope and happiness in remembering these days. The Tenth Doctor is ingrained heavily in the youthful memories of so many, and that childhood excitement is captured well in every page of Issue 7. When reading the section devoted to Tooth and Claw, I realised that, throughout the whole tome, the accompanying music had been playing in my head – it’s that emotive. I never got that same wonder from reading about Colony in Space, Robot, or even Deep Breath; admittedly, it’ll probably happen with Tomb of the Cybermen, The Ice Warriors, and, uh, The Gunfighters – plus other Classic Who serials with the most recognisable scores, like The Curse of Fenric – but this is the first time I actually cottoned on to the fact that these Complete History books catapult their readers so effectively into a long-gone age. And isn’t that what this is all for? Sure, reading about facts and figures, learning new information about something you thought you had utterly comprehensive knowledge about, is fantastic, but we really want to be pulled back into the recesses of our own memories, don’t we? There’s comfort in that, I think: when a new episode airs, I worry that there’ll be something that jars with me – Missy being the Master, for instance, or Clara dying so horribly and pointlessly – but remembering a time when, even if something did jar, we can recognise that everything turned out just fine… It’s safe. It’s happy. And that’s how this volume made me feel. Because there are things in these three adventures that don’t seem quite right: the Sycorax have a specific button that makes one specific ledge fall away from their ship, which serves no purpose whatsoever outside of the Doctor getting rid of the alien’s leader; in a few seconds, the Doctor can cure thousands of infected flesh using a few drips and some disinfectant; and the werewolf is dissipated by too much moonlight. But it doesn’t matter, not in hindsight. I love these stories, not despite their faults but partly because of them too. Tooth and Claw, in particular, has gone up in my estimation over the years: back in 2006, the main thing I took from it was being able to say “Lupine Wavelength Haemovariform” verbatim. Now, I appreciate what an incredible horror story it is. Doctor Who pushes many boundaries, but sometimes, we need to recognise that there’s nothing wrong with feeling comfortable, safe, and happy. If The Complete History manages to convey that sensation, that’s a commendable achievement. In his impressive monologue at The Christmas Invasion‘s conclusion, the Doctor was to have mused, “Am I a fighter? Am I a swordsman? Am I an expert? Am I the sort of man who could happily slaughter you, have you thought of that?” It’s quite a shame these lines were cut. 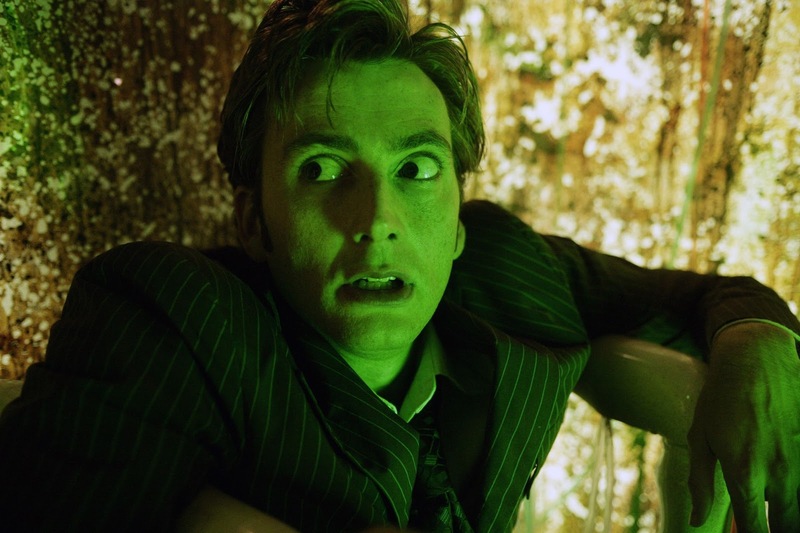 The Face of Boe was to depart his secret – “You Are Not Alone” – in New Earth, but this was deferred when, in June 2005, Davies found out that Doctor Who would definitely return for a third series. Zoë Wanamaker was only available to record for one day before starting work as Ariadne Oliver, making her debut in Poirot: Cards on the Table; if she hadn’t been available at all, Russell would’ve introduced Lady Cassandra’s sister, to be played by another actress. Russell had a checklist for Tooth and Claw and asked another writer, unnamed, to develop the ideas. Said unknown writer then submitted a solid treatment, involving Queen Victoria investigating a series of murders in Buckingham Palace, the eventual murderer being revealed as a vampire – but omitting the important items on Davies’ checklist. This lack of werewolf, warrior monks, and the Koh-i-Noor (the latter suggested by producer, Phil Collinson) provoked the showrunner to develop the script himself. Profiles, this time, are for David Tennant (quite rightly, the most extensive, at six pages), Zoë Wanamaker, and Pauline Collins; while Tennant’s is thorough, it does revisit the theme of “ooh, ain’t he ‘andsome?” too often for my liking. Nonetheless, all three are fascinating, especially Wanamaker’s family history. A special mention must go to the overview of the 2006 series. What a fantastic piece of writing! In just 10 pages (which also includes some full-page images), the writer gets you to completely re-evaluate Series 2, highlighting the fact that, while Torchwood might’ve been the run’s main story arc, its theme was undoubtedly loss. Despite that, The Complete History Volume 51 is an immensely satisfying read, letting readers sink into the warmth of happy memories. It doesn’t feel like 10 years ago, but Doctor Who was the biggest show in the universe, and aren’t we the luckiest fandom in existence…? 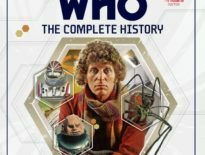 Doctor Who: The Complete History #7 is out now, priced £9.99 in the UK or $24.99 in Australia and New Zealand. NEXT: THE MIND ROBBER, THE INVASION, AND THE KROTONS. Want to subscribe? Head over to the Doctor Who: The Complete History site – and don’t forget about the premium subscription offer too!